The winter transfer window is months away, but the clubs are already in the process of identifying targets to replace or improve on their squad. FC Barcelona is keeping any targets they have close to the chest for now, but the management might be sweating to find a replacement for one player. And that is not Lionel Messi. Messi cannot be replaced, he is unique and the world will be lucky to see him play as long as he can. But there is another player in the current Barcelona squad who is as important as the Little Magician - Sergio Busquets. Busquets was the player Guardiola brought with him from Barca B when he took charge of the senior team. Such was the importance of Busquets in Guardiola's plans. And it was clear why. Busquets fit into the Barca team seamlessly. He was a La Masia graduate so he knew the Barcelona way of football. 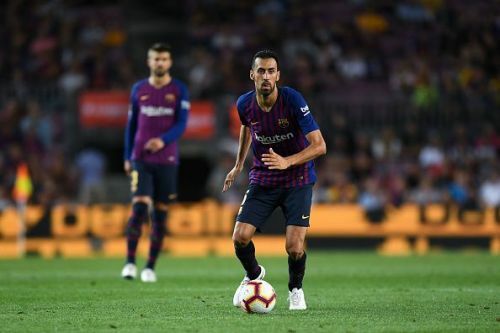 While being lanky and not that mobile, he was the opposite of the other two midfielders he shared the middle of the park with, Xavi and Iniesta. But he was the perfect piece in the puzzle. His strength and tackling brought protection to the backline as Xavi and Iniesta looked to unlock the opposition defense. He also had another surprise up his sleeve, which has made him stand out of other defensive midfielders. His ability to get out of tough situations with his turns and ball control has been replayed many times over. His passing ability was also as good as his midfield counterparts and has been getting better ever since. Many players have been brought in to give him cover over the years. It's sufficient to say, they have failed and Barca never looks stable when he isn't in the team. A few seasons ago when his form dipped, many questioned if it was the end of the road. His dip in form coincided with Real Madrid winning the LaLiga title too. But he came back to prove he is still as or more important to this team as the Catalans won the LaLiga title last season. There have been reports of Paul Pogba coming to Barcelona this winter or next summer. While he is a quality player, if anyone thinks he is a long-term replacement for Busquets, they are wrong. Pogba is a different type of player and prefers going forward rather than staying deep. Other targets have also been sounded out but none have come to Barcelona. In this age of technology where one can track a player's movement, passes, and tackles, among other things, Barcelona can easily identify a replacement. But the lack of transfers for a replacement is telling. While we are lucky to see Messi play every week, we should also enjoy the working of Barca's #5. He is someone who works behind the curtains and sets the stage for others to perform. Sergio Busquets is truly irreplaceable and Barcelona will miss him when he goes. Barcelona News: Carles Alena - "I can be the future of Barcelona's midfield"